Katelijnestaat 40, 8000 Brujas, Belgica. 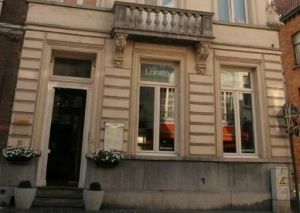 Hotel Loreto is one of the best 3 star hotels in Bruges, a renovated 18th century mansion located in the heart of Bruges, close to the main attractions, and with good transport links to the surrounding areas. Opened in September 2006, the hotel offers modern conveniences and decoration in the historical surroundings of Bruges. With only 7 hotelrooms, which are all accessible by elevator, the hotel aims to give you a cosy and intimate atmosphere during your stay in Bruges to help you feel at home, and the friendly staff are always on hand to help with any query you might have. The hotel is situated in the historical centre of Bruges, and is close to the important museums and the shopping centre of Bruges, making it the ideal location for exploring this culture filled city. Paid public parking near the hotel (open air) (8.70 €). Proximidad a la estación, Centro ciudad, Zona de museos, Proximidad al casco antiguo. Cama de bebé: supplemento de 10.00 € por cama adicional. Breakfast is served from 08.30 - 10.30. Lunch is served from 11.00 - 15.00. The historic centre of Bruges has been a UNESCO World Heritage Site since 2000. It displays beautiful and unique gothic architecture including: The Belfort of Bruges: dating back to the 13th century, the Belfort houses a municipal Carillion comprising 47 bells. The city of Bruges still employs a full-time bell ringer, who regularly puts on free concerts. Onze Lieve Vrouwekerk (Church of Our Lady): Europe's highest brick tower at 122 metres. Bruges also has a very fine collection of medieval and early modern art, including the world-famous collection of Flemish Primitives.